The release from prison of writer Vi Duc Hoi and democracy activist Nguyen Tien Trung on April 12 brings to five the number of prisoners of conscience granted early release from prison since the beginning of 2014. Others released this year are Cu Huy Ha Vu, Dinh Dang Dinh, and Nguyen Huu Cau. 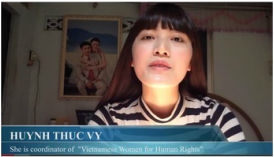 Three Vietnamese women — Do Thi Minh Hanh, Ho Thi Bich Khuong, and Ta Phong Tan — are among 19 international rights defenders highlighted in a global campaign against arbitrary jailing of rights defenders, launched by the International Federation for Human Rights (FIDH) on March 27, 2014. "I am a dissident blogger, a defender of human rights in Vietnam. When I share with you these words, torture and violence against people, especially those who dissent , continues and [becomes] more and more serious." Click on image above to listen to Huynh Thuc Vy's full message (in English). Top Row: Dinh Nhat Uy, Phan Thanh Hai, Duong Thi Tan, Pham Ba Hai, Nguyen Dan Que, Thich Khong Tanh, Tran Thi Hai, Pham Chi Dung. Second Row: Pham Chi Dung, Truong Minh Nguyet, Nguyen Ngoc Tuong, Pham Ba Hai, Than Van Truong, Tran Le Hong, Tran Thi Hai, Nguyen Dan Que, Nguyen Vu Binh, Bui Minh Hang, Le Van Soc; Le Thi Cong Nhan, Huynh Ngoc Tuan, Pham Thanh Nghien, Pham Hong Son. Third Row: Le Nguyen Sang, Rev. Phan Van Loi, Rev. Nguyen Huu Giai, Huynh Noc Tuan, Pham Ba Hai; Nguyen Dan Que, Thich Thien Minh, Nguyen Vu Binh, Than Van Truong, Tran Le Hong, Bui Minh Hang.